1. 秋月秀一, 橋本学, 形状的整合性および配置実現性に基づく3次元物体認識, 精密工学会春季大会学術講演会, A76, pp. 75-76, 2017/3/15. 2. 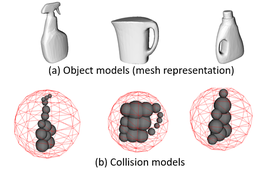 Shuichi Akizuki and Manabu Hashimoto, Physical Reasoning for 3D Object Recognition using Global Hypothesis Verification, European Conference on Computer Vision Workshops (2nd International Workshop on Recovering 6D Object Pose), LNCS Computer Vision - ECCV 2016 Workshops, Part III, Vol. 9915, pp. 595-605, Oct. 9, 2016. 1. 秋月秀一, 橋本学, 3次元キーポイントマッチングのための点群密度変化および欠落に頑健なLocal Reference Frame, 電子情報通信学会論文誌D, 電子情報通信学会論文誌D, Vol.J99-D, No.8, pp.727-736, 2016. 2. 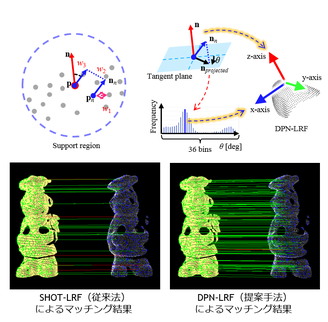 Shuichi Akizuki, Manabu Hashimoto, DPN-LRF: A Local Reference Frame for Robustly Handling Density Differences and Partial Occlusions，11th International Symposium on Visual Computing (ISVC), Part I, LNCS 9474, pp.878-887, 2015. 1. 秋月秀一, 橋本学, Global Reference Frameを用いた対象物の見えに依存しない3次元位置姿勢認識, 精密工学会誌, Vol.80, No.12, pp.1176-1181, 2014/12. 2. 秋月秀一，橋本学, 特徴的3-Dベクトルペアを用いたばら積み部品の高速位置姿勢認識，電気学会論文誌C研究開発レター，Vol.133，No.9, pp.1853-1854, 2013.